For the Latin adjective and its meanings, see sanctitas, saint, and holy. For species named "sanctus", see Sanctus (species). 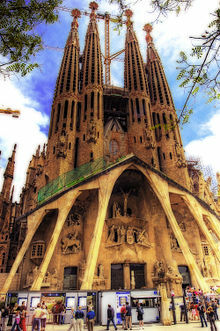 The towers of the huge Sagrada Família church in Barcelona, Spain are decorated with the words "Sanctus", "Hosanna" and "Excelsis". 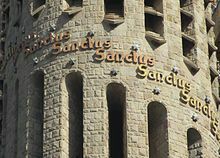 Detail of a tower decorated with the word "Sanctus"
The Sanctus (Latin: Sanctus, "Holy") is a hymn in Christian liturgy. It may also be called the epinikios hymnos (Greek: ἐπινίκιος ὕμνος, "Hymn of Victory") when referring to the Greek rendition. In Western Christianity, the Sanctus forms part of the Ordinary and is sung (or said) as the final words of the Preface of the Eucharistic Prayer, the prayer of consecration of the bread and wine. The preface, which alters according to the season, usually concludes with words describing the praise of the worshippers joining with the angels, who are pictured as praising God with the words of the Sanctus. In Byzantine Rite and general Eastern Orthodox Christianity, the Sanctus is offered as a response by the choir during the Holy Anaphora. Tersanctus ("Thrice Holy") is another, rarer name for the Sanctus. The same name is sometimes used for the Trisagion. Hagios, hagios, hagios Kyrie o Theos. Holy, holy, holy, lorde God of hostes. Glory to the, o lorde in the highest. glory be to the, O Lord most hyghe. The Sanctus became part of the Roman Eucharistic Prayer only in the first half of the fifth century; all in all, this was a fairly late period, inasmuch as by then the text of the Roman Canon had become fixed and was regarded as a text possessing great authority. There exist two fundamental types of Sanctus: the Alexandrian and the Antiochene. The Sanctus of the Roman Eucharist derives from the Antiochene liturgy and has two parts: (a) the Sanctus true and proper, consisting of the acclamation from Isaiah 6:3; and (b) the Benedictus, a christological acclamation taken from Matthew 21:9. The Sanctus has been given a christological interpretation and a trinitarian interpretation, and this in both the East and the West. These differing interpretations may be due to the presence, in the text of the Sanctus, of a theological section, namely, the acclamation from Isaiah 6:3, and a christological part, namely the acclamation from Matthew 21:9. The text of the Sanctus passed from Jewish use to Christian use at a very early time, since it cited in the Apocalypse of John and in the letter of Clement to the Corinthians. the Sanctus consisted of only the first part, the citation of Isaiah 6:3, and lacked the Benedictus; this was the earliest form taken by the Sanctus in the Eucharist. This early state can be seen in the testimonies of Eusebius of Caesarea, the Mystagogical Catecheses of Cyril of Jerusalem, and, above all, the Ritual used in the Church of Theodore of Mopsuestia. In the latter, too, that is, in the archaic stage of the Syrian liturgy, the Benedictus was unknown, and the Sanctus consisted solely of the acclamation from Isaiah 6:3. The text of the second part, beginning with the word Benedictus (Latin for "Blessed") is taken from Matthew 21:9, describes Jesus' Entry into Jerusalem on Palm Sunday, which is in turn based on the first half of Psalm 118:26. In its present liturgical context "it points to the expected presence of the Lord in the eucharistic gifts". Within Anglicanism, the 1552 Book of Common Prayer omitted it and, though it is now permitted, "the choice whether or not to use the Benedictus is still for some a matter of Eucharistic theology and churchmanship". The Sanctus appears in the Sacramentary of Serapion of Thmuis (the saint died in 360), but may go as far back to Christian liturgy in North Africa in the year 200.
in that the Latin adds to the word Dominus (Lord), which is the regular Latin translation of יהוה, the Deus (God), which is found in neither the Greek nor the Latin translations nor in the original text of Isaiah 6:3, but is found in Revelation 4:8: "Holy, holy, holy, is the Lord God Almighty, who was and is and is to come!" in that the Latin has the plural caeli, and the Greek the singular οὐρανός for the mention of "heaven", which appears in neither the Latin nor the Greek translation of Isaiah 6:3. The Liturgy of Saint Basil of the Eastern Orthodox Church has the same form of the Sanctus as the Liturgy of Saint John Chrysostom, with its two variants of the Hosanna phrase. Ἅγιος, ἅγιος, ἅγιος, Κύριος Σαβαώθ· πλήρης ὁ οὐρανὸς καὶ ἡ γῆ δόξης σου. Ὡσαννὰ ἐν τοῖς ὑψίστοις· εὐλογημένος ὁ ἐρχόμενος ἐν ὀνόματι Κυρίου· ὡσαννὰ ἐν τοῖς ὑψίστοις. Ἅγιος, ἅγιος, ἅγι��ς, Κύριε σαβαώθ· πλήρης ὁ οὐρανὸς καὶ ἡ γῆ τῆς δόξης σου· ὡσαννὰ ἐν τοῖς ὑψίστοις. Eὐλογημένος ὁ ἐρχόμενος ἐν ὀνόματι Κυρίου· ὡσαννὰ ἐν τοῖς ὑψίστοις. This text not only omits the article ὁ that is used in the Liturgy of Saint John Chrysostom, but also has Kyrie (vocative case) where the Liturgy of Saint John Chrysostom has Kyrios (nominative). In current use, the Liturgy of Saint James may use the nominative rather than the vocative case of Κύριος; the article ὁ is also not present in this form at the concluding Hosanna. Ἅγιος, ἅγιος, ἅγιος, Κύριος σαβαώθ, πλήρης ὁ οὐ��ανὸς καὶ ἡ γῆ τῆς δόξης σου· ὡσαννὰ ἐν τοῖς ὑψίστοις. Εὐλογημένος ὁ ἐλθὼν καὶ ἐρχόμενος ἐν ὀνόματι Κυρίου· ὡσαννὰ ἐν τοῖς ὑψίστοις. Holy, holy, holy, Lord God Almighty; heaven and earth are full of His glories. Hosanna in the highest. Blessed is He Who came and will come in the Name of the Lord. Hosanna in the highest. Holy Holy Holy, Lord of Sabbaoth, Heaven and Earth are full of Thy Glory. Blessed is He that cometh in the Lord's Name; Hosanna in the highest. ܩܲܕܝܫ: ܩܲܕܝܼܫ: ܩܲܕܝܼܫ: ܡܵܪܝܵܐ ܐܲܠܵܗܵܐ ܚܲܝܠܬ݂ܵܢܵܐ: ܕܲܡܠܹܝܢ ܫ̈ܡܲܝܵܐ ܘܐܲܪܥܵܐ ܡܸܢ ܬܸܫ̈ܒ݁ܚܵܬܹܗ: ܘܡܸܢ ܟܝܵܢ ܐܝܼܬ݂ܘܼܬܹܗ: ܘܡܸܢ ܗܸܕ݂ܪܵܐ ܕܙܝܼܘܹܗ ܡܫܲܒ݁ܚܵܐ܀ ܐܘܿܫܲܥܢܵܐ ܒܲܡܪ̈ܲܘܡܹܐ: ܐܘܿܫܲܥܢܵܐ ܠܲܒ݂ܪܹܗ ܕܕ݂ܵܘܝܼܕ݂: ܒܪܝܼܟ݂ ܕܐܸܬ݂ܵܐ ܘܐܵܬܹܐ ܒܲܫܡܹܗ ܕܡܵܪܝܵܐ: ܐܘܿܫܲܥܢܵܐ ܒܲܡܪ̈ܲ��ܡܹܐ. Holy, Holy, Holy Lord is the Lord God of hosts, for heaven and earth are full of his praises, and of the nature of his being, and for the excellency of his glorious splendor. Hosanna in the heights. Hosanna to the son of David. Blessed is he who came in the comes in the name of the Lord. Hosanna in the heights. Holy, Holy, Holy, Lord of hosts; Heaven and earth are full of Your holy glory. The Sanctus has been set to numerous plainchant melodies, many of which are given in the Roman Missal, and many more composers have set it to polyphonic music, both in single settings and as part of cyclic mass settings. In the Tridentine Mass the priest joins his hands while saying the word "Sanctus" and then, bowing, continues to recite the whole of the Sanctus in a lower voice, while a small bell is rung; then, on reaching the words "Benedictus qui venit in nomine Domini", he stands erect again and makes the Sign of the Cross. He then continues immediately with the Canon of the Mass, while the choir, if there is one, sings the Sanctus. In the pre-1962 form, the choir pauses for the Consecration and continues with the Benedictus part afterwards. As a result of this division, the Sanctus has sometimes been spoken of as "Sanctus and Benedictus". However, in line with Pope John XXIII's revision of the rubrics of the liturgy, the splitting of the Sanctus, when sung to Gregorian chant (though not if sung polyphonically) was forbidden and is thus not allowed in celebrations of the 1962 Tridentine Mass as authorized by Pope Benedict XVI's Summorum Pontificum. In the Mass revised in line with the Second Vatican Council, the Sanctus may, of course, not be split, since the whole of the eucharistic prayer is sung or spoken aloud, and the only ceremony prescribed for the priest during the Sanctus is to join his hands. He and the people sing or recite together the whole of the Sanctus, before the priest continues the Eucharistic Prayer. ^ This is the text of the two present forms (with or without the parenthesised article) of the hymn in Greek; for more details, see the Sources and the Hymn forms in Eastern liturgies sections. ^ a b A recorded example of the hymn chanted-sung in the form with the ὁ article, can be listened to here ( Page will play audio when loaded) (realmedia format). The cantor is the Archon Protopsaltes of the Great Church of Christ Leonidas Asteres, promoted to that position and title by Patriarch Demetrios. ^ a b c A recorded example of the hymn chanted-sung in the form without the ὁ article, can be listened to here ( Page will play audio when loaded) (realmedia format). The cantor is the Archon Protopsaltes of the Great Church of Christ Thrasyboulos Stanitsas (1907 or 1910–1987), promoted to that position and title by Patriarch Athenagoras. ^ See μυστικόν, mystikon; μέλος, melos; πανάγιος, panagios. ^ Cross, F. L.; Livingstone, E. A., eds. (2005). "Tersanctus". The Oxford Dictionary of the Christian Church. Oxford University Press. ^ a b Trempelas, Panagiotes N. (1978) . Εκλογή Ελληνικής Ορθοδόξου Υμνογραφίας [Selection of Greek Orthodox Hymnography] (in Greek). Athens: Soter. ^ Shawn Tribe, "The Mozarabic Rite: The Offertory to the Post Sanctus" (with regularized spelling). English translation: "Holy, Holy, Holy, Lord God of Sabaoth: Heaven and earth are full of the glory of Thy majesty. Hosanna to the Son of David. Blessed is He that cometh in the name of the Lord. Hosanna in the highest. Holy, holy, holy art thou Lord God (The Mozarabic Liturgy). ^ "The Book of Common Prayer Noted: Communion, part 7". Justus.anglican.org. Retrieved 2014-03-11. ^ "The Ordre for the Administracion of the Lordes Supper, or Holy Communion". Justus.anglican.org. Retrieved 2014-03-11. ^ Felix Just, S.J. "Liturgy of the Eucharist". Catholic-resources.org. Retrieved 2014-03-11. ^ Book of Common Prayer. Books.google.ie. Retrieved 2014-03-11. ^ a b Enrico Mazza (1999). The Celebration of the Eucharist: The Origin of the Rite and the Development of Its Interpretation. Liturgical Press. p. 285. ^ a b "Ecumenical Patriarchate. Byzantine Music". ^ "Matthew 21:9". New Testament. biblegateway.com (in Greek). ^ Greek Orthodox Archdiocese of America, "The Divine Liturgy of Saint Basil the Great: A New Translation"
^ Swainson, Charles Anthony, ed. (1884). "Liturgy of Saint John the Chrysostom". The Greek liturgies: Chiefly from original authorities. With an appendix containing the Coptic ordinary canon of the mass from two manuscripts in the British Museum, edited and translated by Dr. C. Bezold. Cambridge: Cambridge University Press. p. 128. At the Internet Archive. ^ For an English translation of the Liturgy of Saint James, see Christian Classics Ethereal Library, "The Divine Liturgy of James the Holy Apostle and Brother of the Lord"
^ Syriac Orthodox Resources, "Anaphora of St. James"
^ Christian Classics Ethereal Library, "The Liturgy of the Blessed Apostles"
^ μυστικόν, μέλος, πανάγιος in Liddell and Scott. ^ "Adrian Fortescue, "Sanctus" in ''Catholic Encyclopedia'' (New York 1912)". Newadvent.org. 1912-02-01. Retrieved 2014-03-11. ^ "Gail Ramshaw, "Wording the Sanctus"" (PDF). Retrieved 2014-03-11. ^ "Library of Congress". Loc.gov. Retrieved 2014-03-11. Wikimedia Commons has media related to Sanctus.